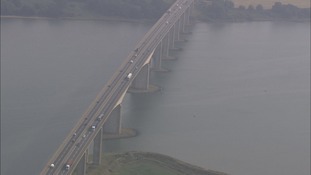 Suffolk's Orwell Bridge on the A14 has been closed due to strong winds. Highways England says winds latest weather forecast predicts that wind speeds are due to peak at between 50-55mph between 10am and 2pm on Thursday. Highways England is constantly monitoring the forecast and any updates will be on their twitter feed @HighwaysEAST. Highways England will continue to be closely monitoring wind speeds, and will re-open the bridge as soon as it is safe to do so. While the Orwell Bridge is closed, the planned diversion route will be via the A1156, A1189 and A1214 through Ipswich. "Drivers planning to travel in the area are encouraged to plan their journey in advance and check the latest weather and traffic conditions along the route. "You can get the latest forecast from the Met Office and local radio. "Drivers making journeys across the region should be aware of sudden gusts of wind, give high sides vehicles, caravans, motorcycles, and bicycles plenty of space."